Boston Wedding Planner Hummingbird Bridal and Events: The Artists for Humanity Epicenter served as the site for both the incredibly touching ceremony and the party-your-buns-off reception. DJ Nikki Robertshaw crafted a beautifully personalized playlist for the couple that reflected their eclectic musical tastes and carried the party from the post-ceremony excitement of cocktail hour through to the glow stick lead dance party that ended well into the night. Boston wedding planner Hummingbird Bridal and Events: DJ Kevin Neary spun tunes all night while guests enjoyed delicious seasonal summer food from East Coast Grill. The Cambridge Multicultural Center provided the perfect venue for this fun evening, and Abby Lorenz was the star photographer for this event, capturing all of the amazing moments like the photo-ninja that she is. Boston Wedding Planner Hummingbird Bridal and Events: The day started out with an amazing ceremony at Sam’s at Louis Boston on the waterfront. Signature cocktails and divine hors d’oeuvres were in order for this couple who have run various amazing restaurants around Boston. And after the cocktail hour concluded, the bridal party hopped into a STRETCH PINK HUMMER LIMO and headed to The Beehive for an amazing order-off-the-menu feast, followed by ridiculous amounts of dancing. This wedding, held at the Essex Conference Center, took place on one of the most beautiful days of the year. The bride and groom were married next to a pond under a rustic, homemade chuppah, decorated with in-season, local flowers from Gordon’s. They ate fresh, New England ice cream and homemade pies for dessert, danced the night away, and partied until the wee hours, singing songs around the campfire. Guests even had the opportunity to enjoy the famous Ipswich Tap Truck! 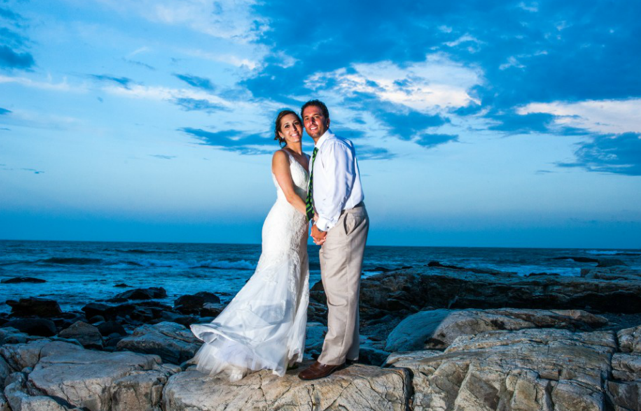 The cool ocean breeze and warm sun created the perfect setting for this beautiful, seaside wedding at the Seacoast Science Center in Portsmouth, NH. The Hummingbird Bridal Team had the most amazing time with Jessica, AJ, their bridal party and families. Jessica told us from day one of planning, “my guests know how to party,” and she wasn’t kidding. Guests danced well into the night, made s’mores around a bonfire on the beach, sang with the band and cheered through every special moment. We were so grateful for the opportunity to work with the incredibly talented Steven Michael Wedding Perspectives (what a FUN team of photographers!) and the incomparable Chill Catering Team. Tipping: Who and How Much? “At the end of my event, who do I need to tip and how much do I need to tip them?” Most often, your caterer will include gratuity in your final invoice, so read through your final invoice very carefully to determine how much has already been included. If your final invoice includes 15% gratuity, but you feel the service and food were better than expected, then you should add an additional tip (5%) to the invoice, or you can hand the gratuity directly to the catering manager at the end of the evening. All photos are courtesy of the extremely talented Tyra Bleek Photography, and special thanks to Night Shift Entertainment, Sweet Tooth Bakery and Bittersweet Gardens. This gorgeous New England summer wedding took us from the Park Plaza Hotel downtown to the elegant Larz Anderson Auto Museum for an elegant ceremony and reception. Gorgeous details included herbed pots for each guest as a favor and tiny lighted lanterns hanging from huge ficus trees that made the gorgeous museum feel intimate and cozy. For this beautiful winter wedding, the bride wanted warmth, coziness and delicious comfort foods. The Museum of Science served as the perfect venue for this lovely December wedding – from fine dining courtesy of Wolfgang Puck Catering to the soft glow of lights off of the Charles River at night, this was an evening to remember. Photography – Little Bat Photography, Florals – Bittersweet Gardens, Guestbook – Etsy, Venue — Museum of Science, Boston.